Vodafone, today launched its final “SUPER WEEKS-6” offer wherein its Postpaid and Prepaid subscribers can Access Unlimited Free Mobile Internet (2G and 3G) for 7 days! 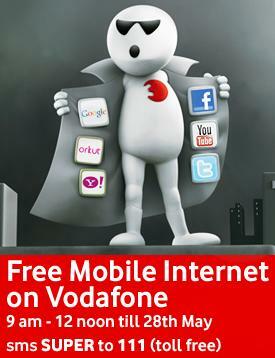 Vodafone ‘SUPER WEEKS’ initiative launched on 16th April which is one ticket to 6 weeks of FUN and Frolic! This week all Vodafone customers across all the circles can enjoy Unlimited FREE Mobile Internet (2G/3G) During “Happy hour” super week.The user will be able to browse Any Site for FREE on their Vodafone mobile/ tethering / Data card between 9 am and 12 noon. This offer is only valid for one week (7 Days) from 9 am Saturday 21st May to 12 noon Saturday 28th May 2011. To avail the offer subscriber needs to send SMS ‘SUPER’ to 111 (toll free).